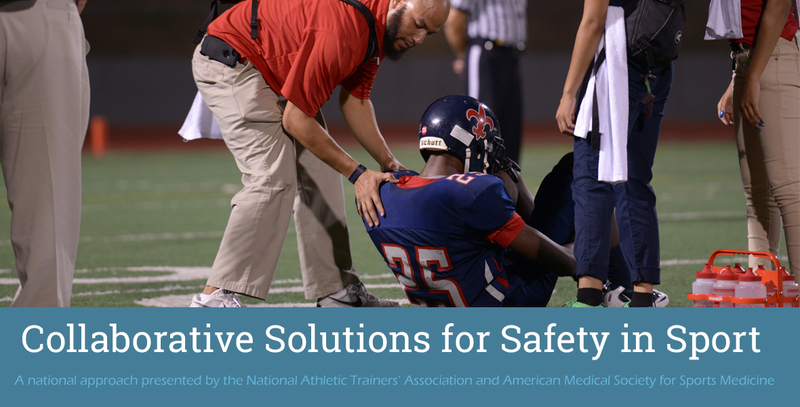 The Collaborative Solutions for Safety in Sport national meeting held on March 28-29, 2017 brought together secondary school stakeholders and sports medicine experts for the third year in a row to advance youth sports safety across the country. This year featured four intensive breakout sessions packed into two days of sharing and discussion, in addition to a review of some of the latest research on access to health care in secondary schools. See below for videos of presentations and discussions and follow-up resources provided by the speakers. NATA and AMSSM wish to thank the planning committee, speakers and sponsors for their hard work and enthusiastic support. Thank you to all those who attended and put their time and expertise into this meeting. We look forward to continuing discussions with you throughout the year. If you have any questions or suggestions, please email Ruth Riggan in the member services department. Douglas Casa, PhD, ATC, FNATA, and Cindy Chang, MD, reviewed current policies, epidemiological data and success stories across the country. Carole Knighton and Hunter Knighton, gave the keynote, "We Can Do More, We Should Do More, We Need to Do More," sharing the story of Hunter's heat injury and recovery. Yuri Hosokawa, PhD, ATC and Robert Huggins, PhD, ATC, gave the day two keynote and reviewed the latest research on the impact of medical care on athlete injury rates and insurance costs.